Human beings, Southern Baptists included, tend to measure progress or success through numbers. The focal verse of the annual meeting is Acts 5:14, ” . . . more and more men and women believed in the Lord and were added to their number.” (NIV). 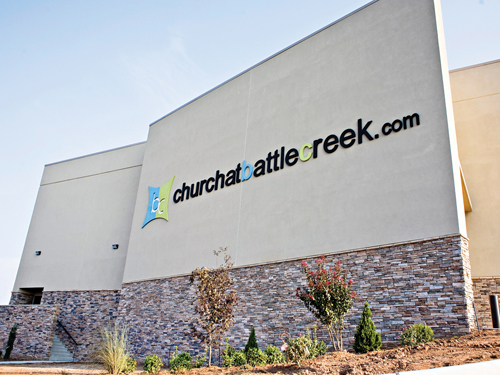 The annual meeting will be held Nov. 10-11 at the Church at BattleCreek in Broken Arrow at 3025 N. Aspen. (See map on page 6). It begins at 6:30 p.m., Monday and concludes after a Tuesday evening service of praise and thanksgiving which also begins at 6:30 p.m. (A full schedule also appears on page 6). This is the first time since 2001 the annual meeting has been held in the Tulsa area, which provides easy access to Baptists in the northeast quadrant of the state. Organizers have listed several tips to make attending the meeting easier for everyone. _ Parking-Those attending are asked are asked to NOT park on the northwest side of the church in the white Park-and-Ride spaces. Parking on the grass areas is allowed. _ Entrances-Please enter either the west or south entrance. The main registration area is through the west entrance. There will be no entry through the north entrance to accommodate the BattleCreek school program. _ Special Meetings-The Ministers of Education will meet from 2-5 p.m., Monday in Room E2; the Baptist Nursing Fellowship will meet from 10 a.m.-Noon Monday in Room M10a. Missionary Parents, Room E2, [email protected]; Midwestern Seminary, Room E8, [email protected],edu; Oklahoma Baptist University luncheon for pastors, Room E1, cost $5. A blood drive to benefit the Global Blood Fund, and more specifically a clinic in Kenya, will be held in Room S5 from 1-4 p.m., Monday and from 10 a.m.-4 p.m., Tuesday. The GBF was launched in April when its first drive was held at the Baptist Building in Oklahoma City. More infornmation about the GBF is available at www.globalbloodfund.com. As usual, pre-convention meetings include the state Pastors’ Conference and the women’s Missions and Ministries Celebration, both of which also are being held at the Church at BattleCreek. The Pastors’ Conference has a theme of “Equipped,” based on II Timothy 3:10-17. It begins at 9:30 a.m. and concludes at 4:30 p.m. on Monday. The Missions and Minsitries Celebration’s theme is “Called to Love” and will focus on poverty and how the poor can be impacted in local communities. It takes place in the student worship center from 1:30-4:30 p.m.